Carpal tunnel syndrome is one of the most common and familiar medical conditions seen in personal injury litigation. Almost everyone's heard of this condition and probably knows someone who has experienced it, but over the years I've realized how poorly it is actually understood. In this article I will provide a basic appreciation of the anatomy involved in this pervasive condition, as well as an overview of the surgical procedure that often prove necessary for treatment. First, we must recognize that the carpal tunnel really is a tunnel. It is a passageway on the palmar side of the wrist, right beneath the wrist crease where the wrist bends on the end of the arm, where the tendons the bend the fingers pass from the arm down into the hand. This tunnel is bordered by the bones of the wrist (carpal bones) on the bottom and the flexor retinaculum (transverse carpal ligament) on the top and the tendons pass through this tunnel moving back and forth as they pull and release the fingers facilitating the normal actions of the hand. 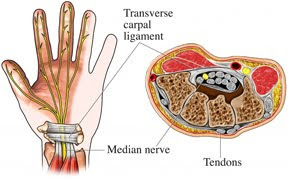 Of importance we note that, along with these tendons, the median nerve also passes through the carpal tunnel. The median nerve is a major nerve that branches off of the brachial plexus in the shoulder region and courses all the way down the arm, passing through the carpal tunnel into the hand. The median nerve is responsible for innervating much of the hand including the thumb, index finger, middle finger and the inner half of the ring finger. 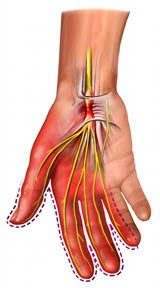 Under normal circumstances, the median nerve is unaffected by the frequent movement of the various flexor tendons around it within the carpal tunnel. Carpal tunnel syndrome is an assortment of symptoms resulting from compression of the median nerve within the carpal tunnel. This can involve pain, numbness, tingling and weakness of the hand or extending up the arm toward the elbow. This compression of the median nerve occurs when other structures in the carpal tunnel region (tendons, bones, flexor retinaculum or synovial linings) become inflamed and swollen and push against the other structures overfilling the space within this tunnel. This inflammation can result after injury such as strain of the tendons or fracture of the bones, or as a result of the stress caused by repetitive motions such as typing, using hand tools, playing sports or playing a musical instrument, etc. There are also certain diseases such as arthritis, diabetes, acromegaly and hypothyroidism can contribute to carpal tunnel syndrome, but these factors are not as commonly seen in litigation. Carpal tunnel syndrome is often treated with immobilization for a few weeks with a splint or brace. Anti-inflammatory medications, such as ibuprofen, are also helpful and sometimes corticosteroid injections may be administered. 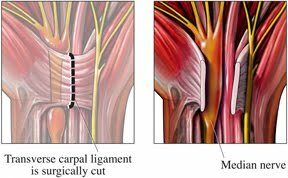 But in some cases, these conservative treatments are not successful and surgery is necessary to decompress the median nerve. 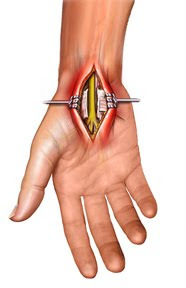 This surgery is called carpal tunnel release or median nerve decompression and it involves the complete transection (division) of the flexor retinaculum that forms the roof of the carpal tunnel. This surgery may be performed through an open incision or done arthroscopically with a scope and instruments inserted through much smaller incisions. Great article on carpal tunnel! Especially like the animation.